Finally! Yours truly have finally gotten a chance to finish off all of JoJo’s Bizarre Adventure: Stardust Crusders, all 48 episodes including the “Battle in Egypt” arc! I have had my ups-and-downs with this iteration within the legendary JoJo’s Bizarre Adventure series, but I have finally watched everything within this installment and have come to a finalized opinion on it! To catch my entire detailed review on the entirety of the JoJo’s Bizarre Adventures: Stardust Crusaders anime, you have nothing left to do but to hit the jump! The premise of JoJo’s Bizarre Adventure: Stardust Crusaders is rather simple. Dio has come back after being at the bottom of the ocean for 100 years due to the events that happened in JoJo’s Bizarre Adventure: Phantom Blood. Dio sank to the bottom of the ocean and stole the body of Jonathan Joestar to survive until he was discovered. Dio’s emergence has caused those of the Joestar bloodline to develop stands, supernatural entities who gift their users with powerful abilities. 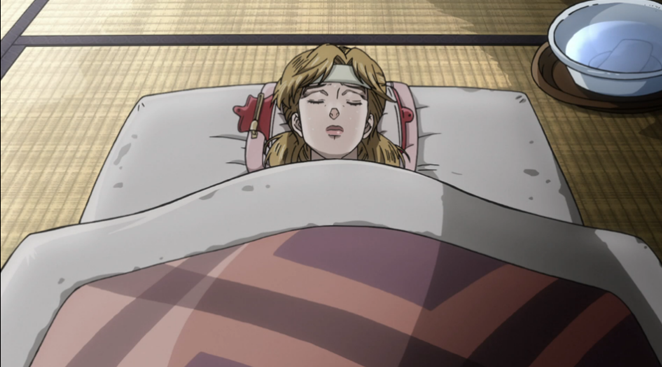 Joseph Joestar’s (the protagonist of JoJo’s Bizarre Adventure’s second iteration, “Battle Tendency”) daughter is not strong enough to handle her’s and it is slowly draining her life away. In order to save Holly, Joseph and Jotaro (Holly’s son) along with comrades they meet along the way, must travel to Egypt in order to confront Dio and put an end to him. However, Dio is aware of their intentions and sends other stand users he has charmed to work for him to confront and kill them before they make it. The story itself was something which made me feel that this series was not as good as Phantom Blood and Battle Tendency simply because the “scale” did not seem as dramatic as the previous installments. The first two installments within JoJo showed that, if the protagonist had not been victorious, the world itself was going to suffer if the antagonist had managed to overcome the obstacles that the heroes had presented. This time around it felt like that the main purpose was to save Holly’s life, and while that in itself is not lacking significance because of who she is to Joseph and Jotaro, it feels not as painstaking as the entire world going up in flames if they lose. Sadly, this feeling remained with me for a good portion of Stardust Crusaders. Something else I was not really feeling about the plot is how would Dio manage to acquire all of those with Stands when they live all over the world? While some people like Avdol actually live in Egypt and it makes sense how Dio would be able to come into contact with them, how is it that he was able to get someone like Polnareff who lives all the way out in France or Kakyoin who lives in Japan? I would have loved for them to explain how he sought out people to recruit. I get that they said people feel uneasy and almost helpless when confronted with his aura and that he is charming as the devil himself, but that does not mean he can just immediately find stand users with his charisma. The Battles present within JoJo’s Bizarre Adventure, which actually take up a vast majority of the story, are well done for the most part. They are placed within the story as assassins of Dio in order to stop our protagonists from reaching him. Their purpose is already planned so it does not feel as though filler episodes occurred through Stand encounters. The only problem I actually had with a lot of the fights is that some of them did take 2 episodes to finish out, which felt unnecessary for some of the powers but justified with others. By the end of JoJo’s Bizarre Adventure: Stardust Crusaders, my feelings about what was going on drastically changed. As they began to approach what they wanted, and due to loads of epic events leading up to the climax, I found myself binge watching on episodes and sitting on the edge of my seat with baited-breath on what would happen next. The dread of what would happen if Dio managed to win had finally kicked in and made the situation dire and desperate in what our heroes had to face. How would they manage to come through victorious? Is it possible for them to recover from the pain and anguish they had experienced? What would happen to them? Things kicked all around in my mind and made the show live up to the hype I had expected since the very beginning of this third installment, and I was NOT disappointed. The ending, while I wished was a bit longer, was actually paced appropriately and was kept free from filler and pointless dialogue (which many anime have a problem with). Many characters were encountered throughout JoJo’s Bizarre Adventure: Stardust Crusaders. We have the protagonists, side characters, and the antagonists. Each had their own personality and their own flare to offer. The main protagonists really did not change throughout the entirety of the series. Joseph had changed from how he was in Battle Tendency (he did not show the smart aleck, predictive personality that he once had. Seemed more mature), but he retained the personality he started with at the very beginning of Stardust Crusaders. Jotaro Kujo still has a typical tsundere-type personality until the very end, not really softening much, only a few times where she shows actual pain or emotion that he announces or displays rather than inferred by the use of camera angles and artistic prose. The only character that truly had a personality shift by the end of the series was “Iggy”. Iggy is a dog that they befriended and brought along with them, and even though he was traveling with the group, he did not really act as if he was concerned at all about what was going on or what was happening. The dog himself was pretty selfish and was detestable (and I did not like him to begin with since I am not very much of an animal person). However, by the end of the series he proves to be a character that held a special place in my heart and his change is very visible. The side characters that you meet are few-and-far between. Sometimes we have someone get mixed up with the foolishness that is brought by ambushing Stand users, and sometimes they are just there to act as background characters. There were only a few standout characters that made short-lived appearances that were noticeable. There really were no recurring side characters aside from those who were part of the protagonist’s family. 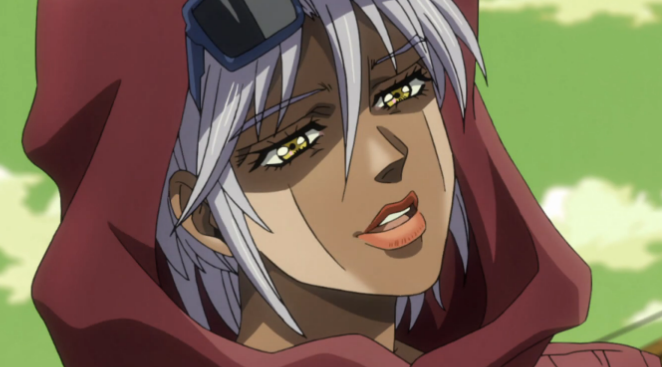 There was a woman who showed a particular kindness to Polnareff whom stood out to me the most, however, side characters in JoJo’s do what they are supposed to do and fulfill their purpose as background fillers or cannon fodder. The antagonists of the series also take center stage, as they are often seen only once (though a few appear multiple times), but they play much bigger parts. There were a few particularly ruthless or eccentric characters that made a lasting impression on me, but for the most part, nearly every enemy that they encountered has been memorable in their own right. The main protagonist, Dio, is still as he was when we first encountered him during episode 1 of Phantom Blood. Power hungry, ruthless, and with complete disregard for anything other than his own ambition, Dio is the person we all love to hate. Equally as powerful, the ending of Stardust Crusaders sees him within his full glory and it gives everyone a right to fear him. Very well done. As a whole, they designed the characters and named them in a very unique way. Something that has always been present within JoJo’s Bizarre Adventure is the character designs and the unmistakable style which accompanies it. Though a lot of the series happened to be inspired by Hokuto no Ken (Fist of the North Star), it has its own distinctive flavor which spills out into the characters by the way that they look and operate. Something else I feel that needs to be addressed is the various openings to JoJo’s Bizarre Adventure: Stardust Crusaders. We have three different openings for this third installment within the franchise. The first for JoJo’s Bizarre Adventure: Stardust Crusaders (episodes 1 – 24) known as “Stand Proud”, the second for JoJo’s Bizarre Adventure: Battle in Egypt (episodes 25-46) known as “End of the World”, and the third is an impactful variant of the second opening (episodes 47 and 48). JoJo’s Bizarre Adventure has constantly had some of the BEST openings I have ever seen in any anime to date. 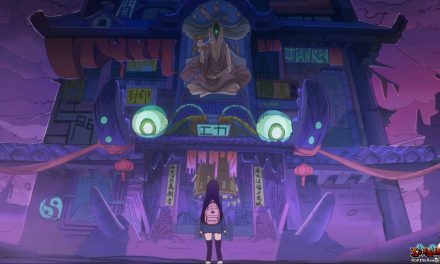 The thing about them, is that they often sing about what is happening within the series itself and you can see clear signs of what happens within the actual anime within the introduction. 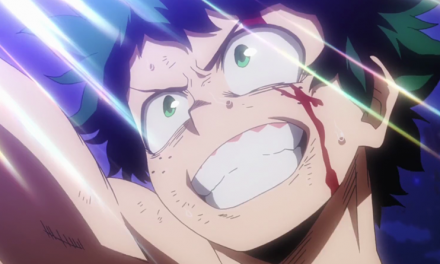 A lot of series do not have introductions that fits with what is going on by either having the characters in situations they do not get into within the anime or the song is just meant to entrance the viewer. The depth and meaning behind the Phantom Blood (Sono chi no Sadame) and Battle Tendency arc’s opening was incredible, Stardust Crusaders proudly carries on this tradition with both “Stand Proud” and “End of the World”. STRENGTHS – Excellent and eccentric characters, brilliant plot, Epic enemy encounters, Satisfying ending, Justified continuation of Phantom Blood and Battle Tendency. WEAKNESSES – Certain battles can feel longer than necessary, The importance of the story is not realized until the very end. 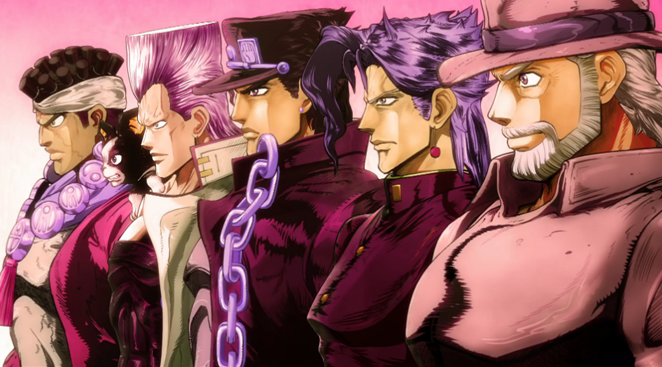 JoJo’s Bizarre Adventure: Stardust Crusaders marks itself as another great entry into a legendary series. While at first I was disappointed by the lack of urgency presented by how they were more interested what will happen to Holly than to the world if Dio lives, I realize the terror which they faced by the end of the series. The feeling of dread of what would happen if our heroes did not win, and the wonderment of how exactly they would defeat a foe with incredible power with the resources that they had available. The constant escalation of the action and severity of the stand users our protagonist’s faced made the anime more thrilling and compelling as time went by, also leading me in the same direction that the end of the anime produced. The characters themselves begin to grow on you after watching them for so long, and events later on down the line solidify the resonance they begin to have with the viewer. Attachment cannot be seen until the latter episodes, but it clearly speaks to the audience when it is time to test whether-or-not that bond has been successfully created. I recommend EVERYONE who has not watched JoJo’s Bizarre Adventure before to try it out and see if you will like it. 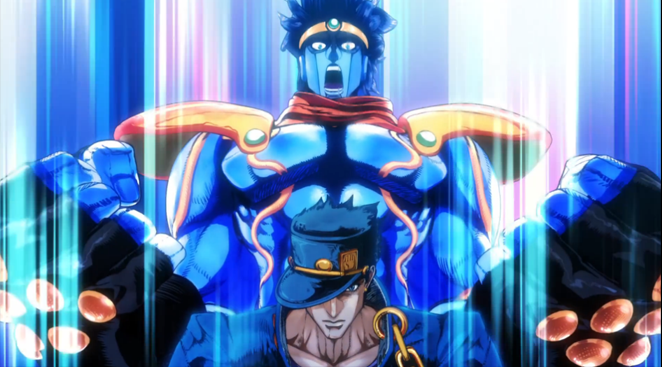 Stardust Crusaders is one of the most popular entries within the manga and the anime has been well-received for good reason; I cannot believe I was doubting this series and constantly questioned whether-or-not it had lost its touch, to which I now feel doubly embarrassed about. This is a classic series and is unquestionably one of the best ever created. The only hope I have now is that we get the fourth installment, JoJo’s Bizarre Adventure: Diamond is Unbreakable. Thank you for reading! PreviousMegadimension Neptunia VII: First English Screenshots!